This guide contains advice for visiting the main sites of Shaanxi, the central region of China, known above all for its capital Xi’An, the ancient Chinese capital. Lo Shaanxi (not to be confused with Shanxi) is an extensive region, but the recommended sites are in the areas around Xi’An, where the majority of tourists are concentrated: rather, a multitude, considering that this city is the second most-visited place in China. Xi’An is rich in archaeology, which you can’t ignore if you come here. OK, there there’s Hua Shan, one of the five sacred Chinese mountains, to add a touch of sport and challenge to sentimental trips. Hancheng and the village of Dangjiacun, Yan’an. A trip to Shaanxi is relatively “easy” and less troublesome than other regions in the remote far west, such as Yunnan or Tibet. 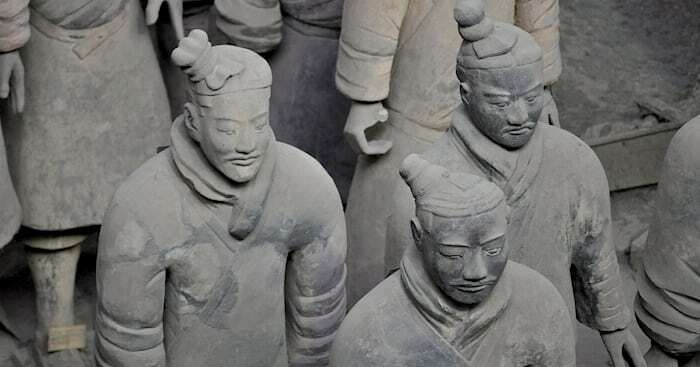 The capital Xi’An was a nerve center for at least four dynasties, and the eastern border of the Silk Road: today it’s, in a word, The Terracotta Army. So it’s in Xi’An, the most recommended starting point for each successive stop, where you can calmly arrive by plane from every corner of China. If you’d rather avoid takeoffs, from Beijing there’s a train (a little less than 6 hours) with frequent enough departures and a cost of about 500 Yuan. Halfway between the two and comfortably connected by train, there’s the village of Pingyao, which many find an interesting intermediate stop. To visit the city of Xi’An, one intense day is sufficient for experienced walkers, but if you’d like to experience it more peacefully and even take in the museums, which have perfectly preserved pieces and will save you from the elements (atmospheric and historic), then I don’t recommend less than two days. To this you must add the necessary tours of the archaeological sites as well as trekking on the Mountain of Splendor (a.k.a. Hua Shan). To get further north to Dangjiacun, keep in mind that there’s over 200 km separating it from Xi’An. The site of the Terracotta Army is very well serviced: buses leave from the Xi’An station; whether you take public transport or private, the price is still ridiculous and you’ll save about 7-8 Yuan. From the same station buses leave for other archaeological sites of interest, and are recognizable because they are preceded by the character 游 (which is pronounced “yóu”). If you have no idea which it is, write your destination in characters, someone will lead you to the right bus. To reach Hua Shan there’s a very comfortable fast train that stops in town; from here you can catch a taxi for the gate or if you’re luckier, at the foot of the mountains. There are also buses and minivans that shuttle between the station and the starting point. Don’t be taken in by those offering to sell you a cheaper ticket and take you closer to the summit: the starting point is the same for everyone. To get as far as Hancheng, 9 km from Dangjiacun, there are long range buses or trains, but of the “regional” variety. Toward the village of Dangjia you can also get there on bicycle or by other more Spartan means, or simply work out a ride with some locals. In any case, as always in China, any of these stretches are reachable also by private transport arranged on the spot or even hotels from Xi’An. Xi’An – Hua Shan – Dangjiacun. 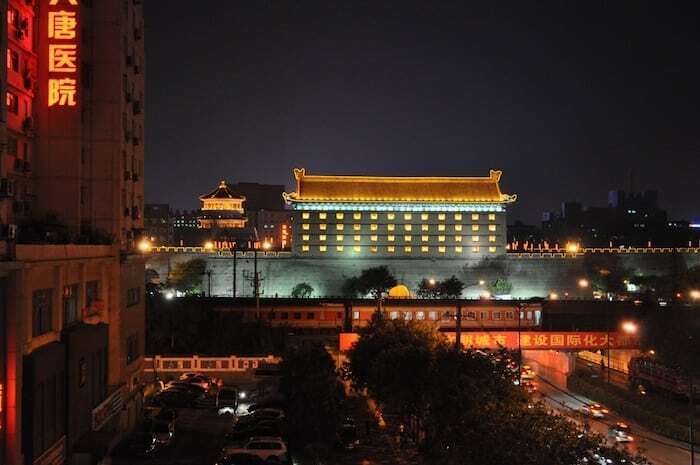 Le mura:The city of Xi’An proudly wears its glorious past: it is surrounded by walls that you can choose to visit both inside and out, from top to bottom, by tandem colored horse. Sometimes you’ll come across shows or interpretations in Chinese style at the border of kitsch. Muslim Quarter: it is without a doubt the most attractive part of the city accessible outside the massive Tower of the Drum, which has a sister, the Bell Tower. These are worth the visit if you’re in the music field or if you want to get involved in the scheduled audio shows. 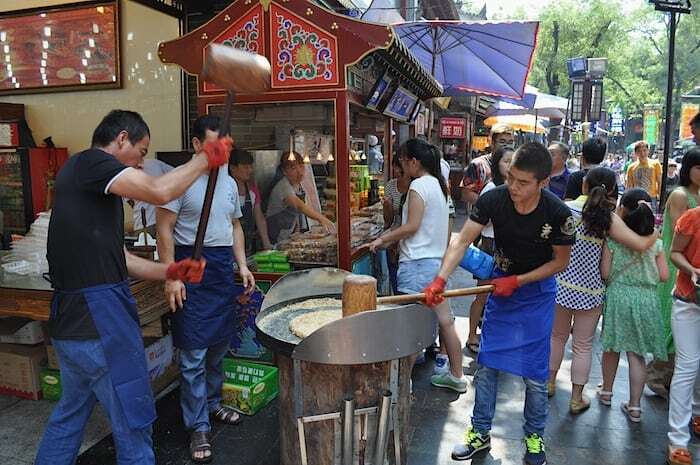 The Muslim Quarter is all of Xi’An; here you can relive the traditional ethnic cuisine of China: if you’re not vegetarian, you can taste renowned soups of fish, meat and lamb at will. 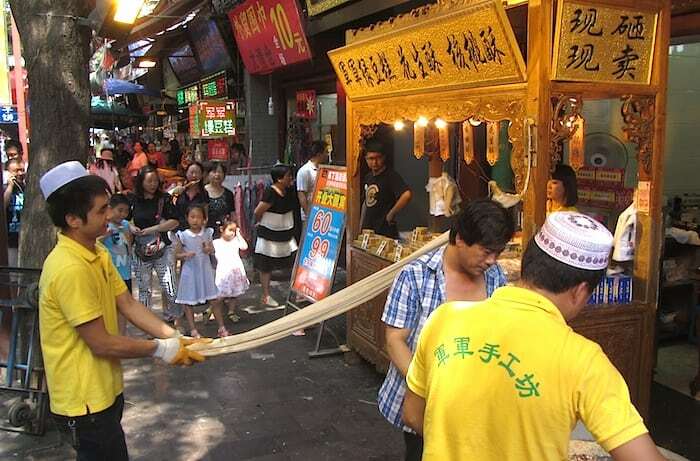 For those with a sweet tooth, the dried fruit is elevated to a universe of appetizing delicacies: sticky delights at thousands of calories a bite, composed of peanuts, dates, walnuts, cashews mixed with rice directly on the street are a real attraction. There’s even handmade peanut butter made to the sound of giant hammers! Entering the Muslim Quarter means being inundated by sounds and odors, besides a pressing crowd of people. If the crowd makes you hot, allow yourself to be tempted by freshly squeezed juices. Grand Mosque: another beautiful stop to complete the Muslim area. It is one of the biggest in China and the local neighborhood street market boasts of small stores with valuable pieces, though the greater number of vendors have given in to the easy influence…of plastic. I’ve even had a decent cup of Italian espresso there! The Pagodas outside the walls: the Pagoda of the Grand Goose is another feature of the city: you visit by working your way up to the top through various stairways, and it is highly not recommended if you cannot handle the lines – in high season, the tower is full of tourists that lose themselves in photographic services without end -. A show of lights and water awaits at the foot of the Pagoda every day for daily appointments during the summer. Obviously the strategic spots to appreciate it fully are few in comparison with the masses running around, armed with millions of Yuan in iPhones, and the same observation points are filled well in advance of the show… Right nearby is the restaurant First Noodle Under the Sun (天下第一面酒楼), super crowded, which offers the famous biang biang mian, or 3.8 mt noodles on the menu, which are very complicated to eat. Despite having smaller dimensions, my favorite is still the Small Pagoda of the Wild Goose, for the natural aspect and the pleasing garden that surrounds it. In front of the Pagoda, right on the other side of the street, is one of the best restaurants I’ve ever set foot in in China: it’s called Real Love Cuisine (真爱中国餐馆). I spent the night in a hostel right by the Yuan Gate, Xi’An Traveling with Hostel Yuan Men; a little hard to find, it faces a principal artery and is near the station where buses leave for excursions outside the city. Here you’ll find our guide of the best hotels in Xi’An. A visit to Xi’An is “incomplete” if it doesn’t include the Terracotta Army. It’s like going to Beijing without seeing the Forbidden City. But, prepare yourself for the worst, especially if you plan a trip in high season. The Terracotta Army is an extremely crowded and photographed place, which weakens the magic of the historic atmosphere, with its soft lights and dispersion. 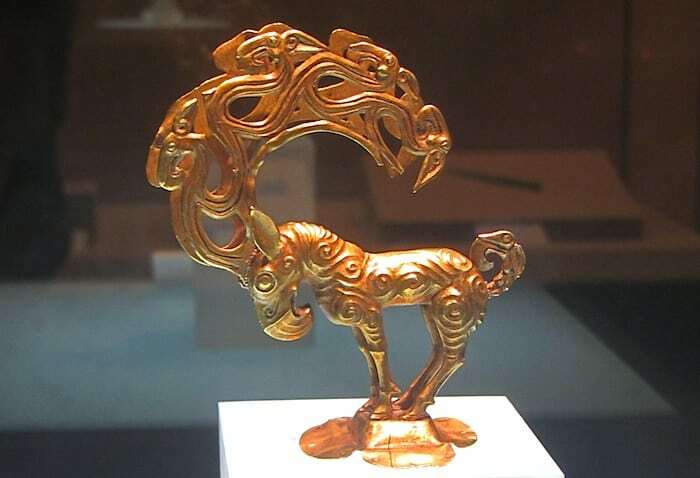 Nevertheless it’s worth it due to its magnificence and dimensions, since it is the principal site and is a long trench in which they are still digging and continually finding these uniquely sculpted figures. There are captions in English, discreet but not exhaustive; a helpful support that might help you to understand a little bit more. As numerous guides suggest, the best order of visiting them is site 2, 3 and lastly 1. The complex is covered, so if you get a rainy day (like I did), this is the card you should play. 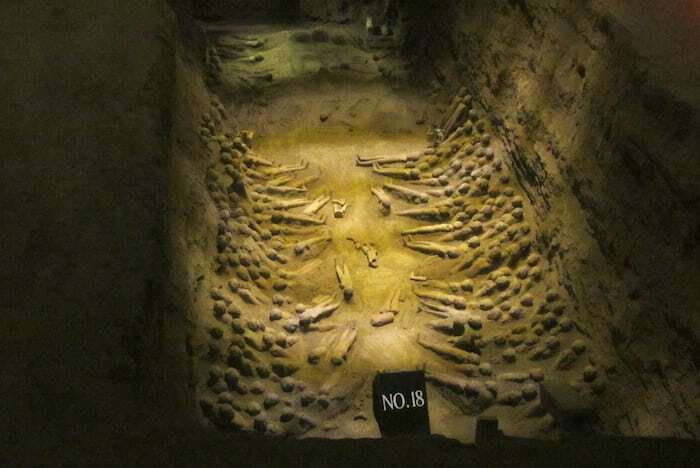 Next to the Terracotta Army, 1.5 km away, you’ll find the Tomb of Emperor Qin Shi Huangdi. There’s not much to see, in fact, but legends rage about it. Of the other three sites, namely the Tomb of Qian Ling (which is actually a complex of tombs), the Famen Temple (with the Pagoda alongside) and the Tomb of Emperor Jingdi, without a doubt I recommend the last one. The guided tours don’t usually take in these stops, but prefer to take care of the sites above to end at the thermal springs of Huaqing. 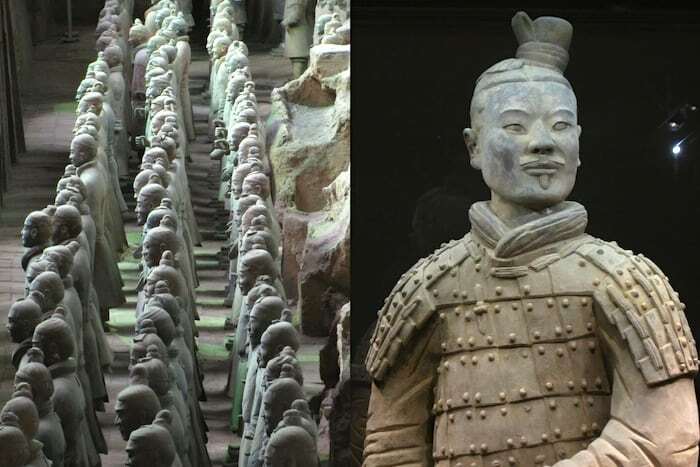 However, if the imposing Terracotta Army fascinates you, surely the Tomb of Jingdi will not disappoint: it’s a stretch of miniature figures sculpted with precise details; some even were dressed at one time. The interactive museum display allows a look at the excavation activity and history. Above all you can enter into the enormous mound of the tomb itself, just you with the treasure of buried statues in defense and company of the emperor. 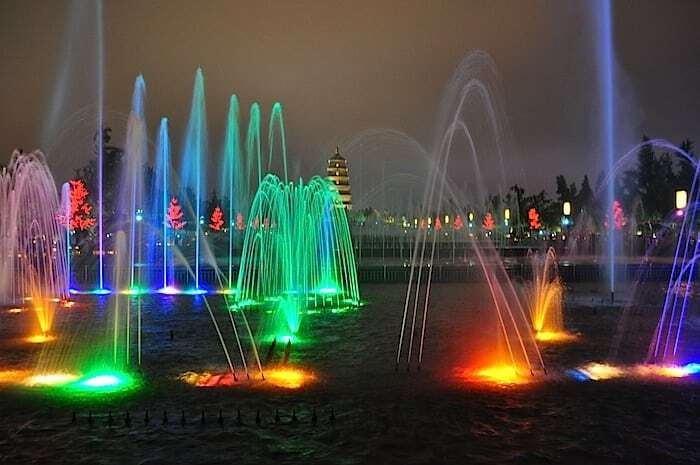 The site is 15 minutes by car from the airport, so the solution for optimizing your time is to rent a private car at the end of your stay and stop at Jingdi before taking off. This is for enthusiasts, also because it’s less trampled than its terracotta older brother. The Hua Shan is an imposing mountain of rock divided into peaks and completely walkable thanks to the endless stairs that cross it like spiderwebs. For those in less than great shape, there’s a chairlift service that allows you to get up top and back, but the walk between peaks is really challenging. 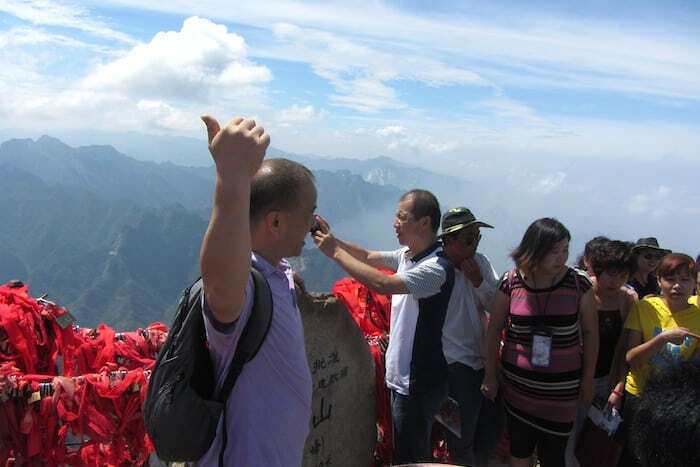 The trip to Hua Shan is doable in a single day, obviously taking into account walking for kilometers. Personally, I chose to get up by chairlift, walk between peaks on foot, and then descend on foot via the stairs carved into the rock, which in some points are carved into the rock. But this cost me about 14.000 steps and a sharp pain in my legs that not even Chinese massages were able to cure…for days! However the trip is worth it for the views from the top, so long as it’s a clear day. Alert! If you’ve already climbed Huang Shan, or the Yellow Mountain (Anhui), expect different views that aren’t all that far off. The facilities with crowded streets, fenced observation points for paid photographs, padlocks and prayers in red hung everywhere, is the same. On the premise that I did not spend a night at the top and therefore didn’t have the honor of seeing the sunrise from the peak, I felt the most amazing part was the road down, with a few glimpses far away from the crowds and the gray of the Chinese city. 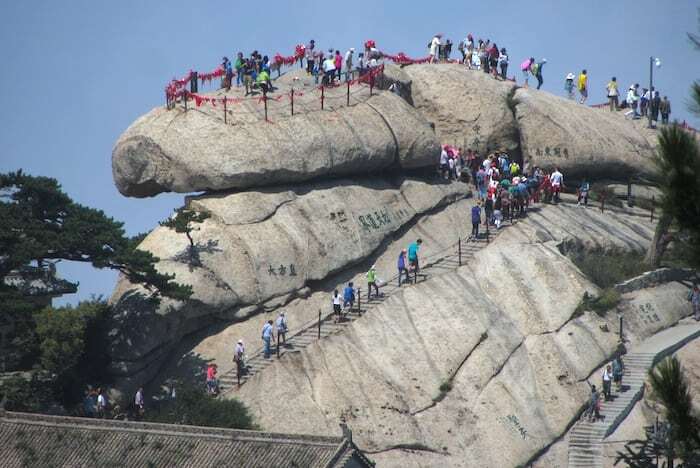 As on Huang Shan, even at Hua Shan pay attention to the prices if you want to spend the night at the top! Being easily reachable from the city via train, it is simple solution requiring only one day. About 200 km north of Xi’An, the two villages of Hancheng and Dangjiacun can be defined as sites “off the beaten path”. For those with little time, it’s actually a bit inconvenient to head north, unless you’re thinking of going toward Pingyao. Hancheng is more of a support and arrival point for bus and train arrivals; Dangjiacun on the other hand, is the real attraction: an almost entirely preserved village in which the architecture dates back to the 300’s. A few hours are all that are needed to lose yourself in a pleasant walk before returning to Xi’An, since this too is an easy day trip from a base in Xi’An. If you don’t want to submit yourself to public transport timetables, city hotels organize day trips and are always available to provide a driver. You can also choose to spend a night in Hancheng or adventure out to Dangjiacun, often on the improvised beds of a family. This guide for Xi’an is very well done. I might even change my annual pilgrimage to Mt Yulong!